BUT DON'T CHEAT AND LOOK AT THE ANSWERS UNTIL YOU'VE FINISHED! This website covers all you need to get to grips with music theory and is best used inconjunction with some theory lessons with a teacher. Start on this page and learn the basics before you try the other subjects. Always do the worksheets and try and do at least one lot of homework a week. Every so often you will come across some MASTERY worksheets (look for the red banners). These will help you check that you have learnt everything you need to before you move on to another subject. Music is written on five lines called the stave. The higher up the 5 lines the higher in pitch the sound is. A clef at the start of the music tells you how to read the notes. TREBLE CLEF is used for most things especially lead sheets, female singers and most instruments. It is also called the G clef because the clef starts on the G line (see where the red dot is below). BASS CLEF is used for lower instruments - bass guitar, the left hand of the piano and low male voices. It is also called the F Clef because it's dot is placed on the F line. MIDDLE C is the C in the middle of the piano keyboard and also the C in between the 2 staves. CLICK HERE to hear what is sounds like. LEGER LINES are short little extra stave lines allowing you to write notes too high or low to fit on the stave. E.G. MIDDLE C has one leger line through it. The keyboard is set out with white notes (they are the C Major scale) and black notes grouped in 2's and 3's. The smallest step on the keyboard is called a SEMITONE (eg C to C#). A step of two semitones is called a TONE (eg C to D). 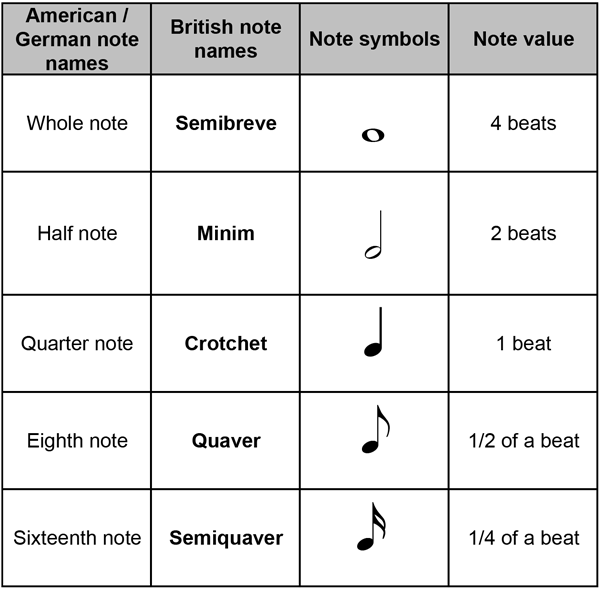 BEWARE there is no black note between E&F or B&C. Therefore E to F is only a SEMITONE and so is B to C.
You need to become familiar with the piano keyboard - it is very useful for working out all sorts of music theory problems. I recomend you buy a small keyboard (minimum 3 octaves). Failing that HERE is a template for you to print out and refer to. In theory exams it is a good idea to be able to draw a keyboard. SHARPS: If you raise a note by a semitone you sharpen it. (eg the note a semitone higher than C is called C#). The symbol for sharp is the hash symbol. FLATS: If you lower a note by a semitone you flatten it. (eg the note a semitone lower than D is called Db). The symbol for flat is an angular b.
NATURALS: A note that is neither sharp or flat can be called 'natural'. You will use the treble clef for lots of things so it is a good idea to practise drawing some. The rhythm of music is written down using these symbols. One beat is called a crotchet. Half a beat is called a quaver etc. 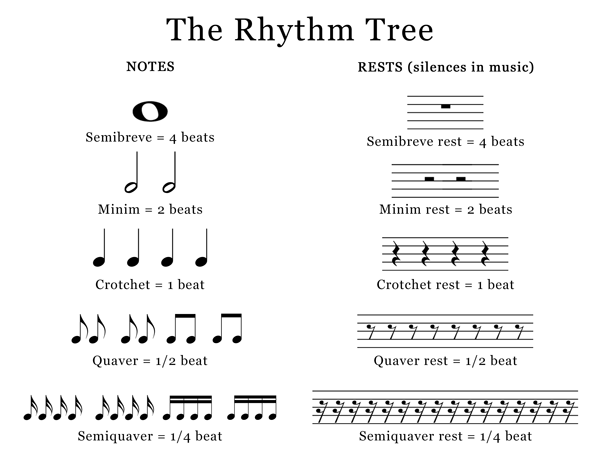 The RHYTHM TREE below shows how the notes are ordered. See the page on time signatures to understand who we group rhythms together into groups called bars. RESTS are silences and are also shown below. A note with a dot after it becomes one and a half times the original length. EG A minim is worth 2 beats. 1/2 a minim is 1 beat. 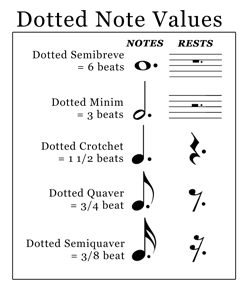 So a dotted minim is worth 3 beats (2+1). Now go back to the top and try some of the worksheets. © 2018 Sue Richardson, All rights reserved. The resources on this website are for students personal use only. Please DO NOT reproduce without permission. Thank you.